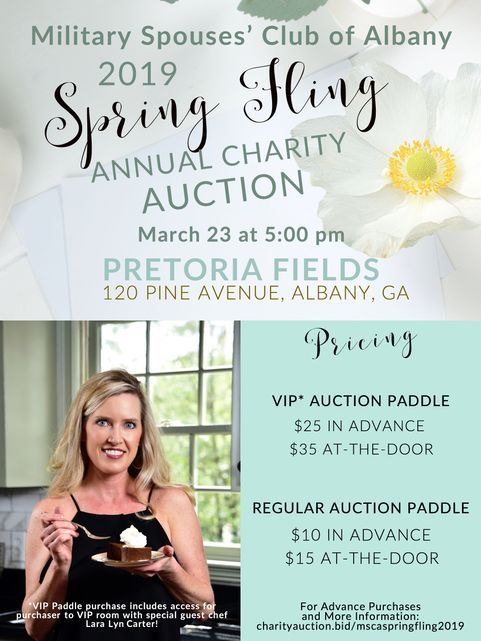 The Military Spouses’ Club of Albany (MSCA), previously known as the Officers’ Spouses’ Club, is a nonprofit organization located in Albany, Georgia, whose mission is to provide enrichment and support to the military, their families, and the local community. The Military Spouses' Club of Albany exists to offer support & build camaraderie amongst active duty spouses, retired spouses, & civilian Marine spouses associated with Marine Corps Logistics Base Albany. Through social activities and by providing support to our local community through volunteerism & fundraising, we are able to build lasting friendships and foster personal growth. Each year, the MSCA hosts an Annual Auction with all proceeds benefiting our Scholarship & Community Grants fund. In the past nine years, the MSCA of MCLB Albany has given over $121,000 in scholarships & grants to individuals and organizations directly related to MCLB Albany. This year's Auction was a great success - due to the support of countless businesses and supporters! We look forward to next year's Auction! THIS IS A PRIVATE ORGANIZATION. IT IS NOT PART OF THE DEPARTMENT OF DEFENSE OR ANY OF ITS COMPONENT, AND IT HAS NO GOVERNMENTAL STATUS.